Wow Windows – The window dressings in the 80s were over the top, just like the shoulder pads and big hair. Vertical blinds reined supreme (who hasn’t gotten in a tangle fight with vertical blinds?). However, drapes were the statement makers—and the bigger, the better. The more newspaper stuffed into a balloon valance, the hipper it was. (How many yards of fabric per window? The world may never know…) Drapes that identically matched the wallpaper were very expensive and a sign of excellent taste—especially if the patterns were dainty florals or a hip pastel shade. Now, window decorations are often more streamlined but there are still those who favor the puffier window treatments of decades past. Nothin’ but Brass & Mirrors – Brass was the “it” finish. From faucets, light fixtures, furniture, door handles, fireplace screens and beyond—if it existed, a brass finish made it better. The only exception was if you could put a mirror on it. In the 80s, if you could put a mirror on it, you should (and did). Mirrored closet doors, mirror art, and mirror walls were commonplace. These days we snicker at funhouse rooms full of mirrors and ditch the brass in favor of brushed nickel or oil-rubbed bronze; but in 15 years, we will probably scoff at those in favor of the fresh trend. Color…Wonderful? – Well, I don’t know that I would personally describe the 80s color trends as wonderful—but some are independently making a comeback (sea-foam green, anyone?). However, the 80s had some dubious color combos like hunter green and mauve. Does anything really look good with mauve? (I am undecided on that front.) Any color of pastel was an instantly chic look. Peach walls with mint green furniture…goodness gracious, that was rad! Many of the “it colors” from the 80s have regained popularity today–except mauve, which is probably a good thing. Wallpaper Galore – Oh, that Laura Ashley, she made wallpapers that imitated her dresses—flowers, flowers and more flowers. From borders to wallpaper accent walls, papering was on trend. Wallpaper has been out of style for years, but is making a slow comeback with modern oversized tone-on-tone prints and classically textured papers. No matter what decade you are in, one thing remains true when it comes to wallpaper: you will curse the wallpaper on two days—the day you put it up and the day you take it down. Geometry, Of Course – If it had shapes on it, it was hot. Primary colored shapes? Even hotter! It’s hard to believe that these types of patterns and color combos were ever fashionable, but they were everywhere. This also played into the Southwestern design craze of the 80s, which is making a modernized comeback in the form of Aztec designs and chevron prints. It’s funny to look back at what was hot and how it is so not now. Today’s hot trends will be just the same in the blink of an eye. Not gonna lie, I’m thankful that some of these trends never became a classic, but I guess there’s always time. For a complete list of currently available real estate in Palestine TX and surrounding areas, click here to start your search. Make sure to subscribe to this blog so you don’t miss out on current market information and Palestine TX area events. 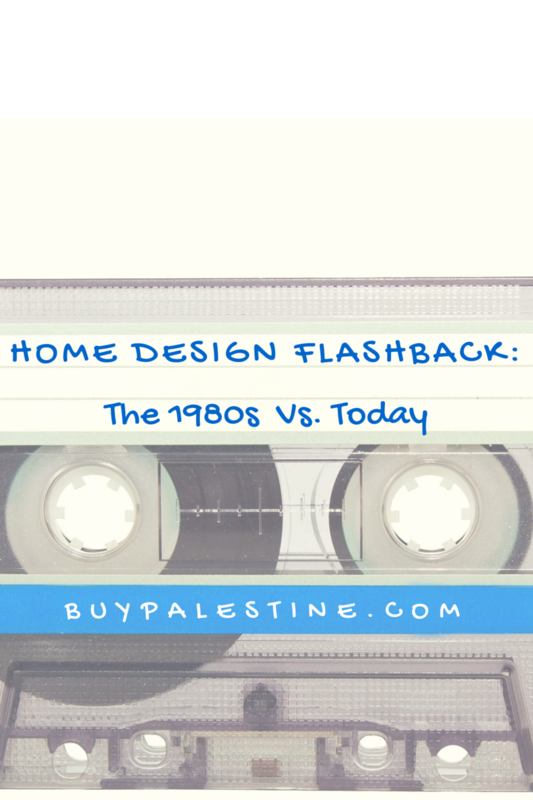 Lisa E. Priest loves a good throwback and is an East Texas REALTOR® with Picket Fence Realty, Inc. You can reach her via phone or text at 903-948-3343 or read more at BuyPalestine.com.